a. 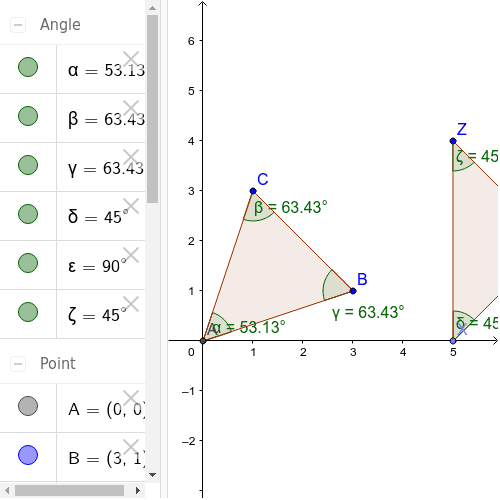 Using the taxicab metric find the lengths of the sides of triangle ABC and triangle XYZ with the given points A=(00), B=(3,1), C=(1, 3), X=(5, 0), Y=(7, 2) and Z=(5, 4). AB=4, BC=4, CA=4 XY=4, YZ=4, ZX=4 by d(P, Q) = |X_p - X-q| + |Y_p - Y_q| b. Is it true that these segments are congruent? They all equal 4 so yes they are congruent. c. Are triangle ABC and triangle XYZ congruent? They are not congruent. A number of the triangle congruences break down in Taxi cab. The only one that we can get is that given the lengths of three sides are congruent and two of the angles are congruent we can get that the last angle is congruent because we know that the sum of angles is equal to 4 t-radians.